Well, the snippet below tells a different story (taken from https://www.kickstarter.com/projects/1116368506/evercam-the-wirefree-security-cam-with-365-day-bat). To me, this means that IFTTT is definitely coming, and this is different than saying that it's still being evaluated. Are you making false promises to your backers? It's still in the plan, but we are evaluating whether it will be implemented. Your voice is heard, however. Saying it is still planned but then saying you are evaluating whether it will be implemented is a conflicting message. If it is still the plan, you wouldn't be evaluating. You would just be working on implementing it. We've been requesting it for years. Agreed. IFTTT was PROMISED, so don’t you dare now say you’re evaluating whether or not it will be implemented. The technology requirements for IFTTT are substantially less than for HomeKit, there is no excuse whatsoever for failing to follow through with it, and it would substantially improve usability - especially for functions like mode changing between home and away based on physical location. I for one will be asking to return the system if this doesn’t change very shortly. IFTTT are a way to make it extremely more versitile. You dont even have to make own keypads etc. there are already out there. You could also make rules like turn on one or more lights When a person is seen. Instead off sounding the alarm. This can make both me and my neighbors more happy with the cam. Hi! Any news about IFTTT support? Have you finished evaluating it and started implementing it? When can we expect it? Weeks ago, you mentioned that IFTTT support for the EufyCam is "still being considered", despite the fact that it was promised on Kickstarter. Has there been any progress? Has a decision been made whether to support it or not? If you have decided to support it, when can we expect it? If not, can you please let us know how to return the camera? IFTTT integration with other home automation kit was the primary reason why I chose EufyCam over other competitors, and if it's not going to be supported I would like to know sooner rather than later. +1 almost end of January, @AnkerSupport any update? +1 for IFTTT integration. We need more than just Alexa integration for these cameras to compete with most all other solutions out there. Some of the future roadmap items could quickly be addressed by IFTTT for the short term. Please continue working on more home automation integrations. come on guys, IFTTT support is hugely important for most home automation customers. you've been saying you're going to do it for a few years now !!! Open up your API and let someone else design it if you can't be bothered to! This FAQ seems outdated. Since then Apple HomeKit has been dropped. IFTTT is in works and planned to implement soon. Hi, @Ice1. That FAQ is exactly what we all based our buying decision on. It's basically a contract, so Anker can't drop features at will. Do you work for Anker? If so, I'm going to take your statement about IFTTT support at face value. If you don't, can you please post its source? Thank you!! @carminecristallo I don't work for Anker. I am a backer just like you,, And I understand the risks of backing a kickstarter project. 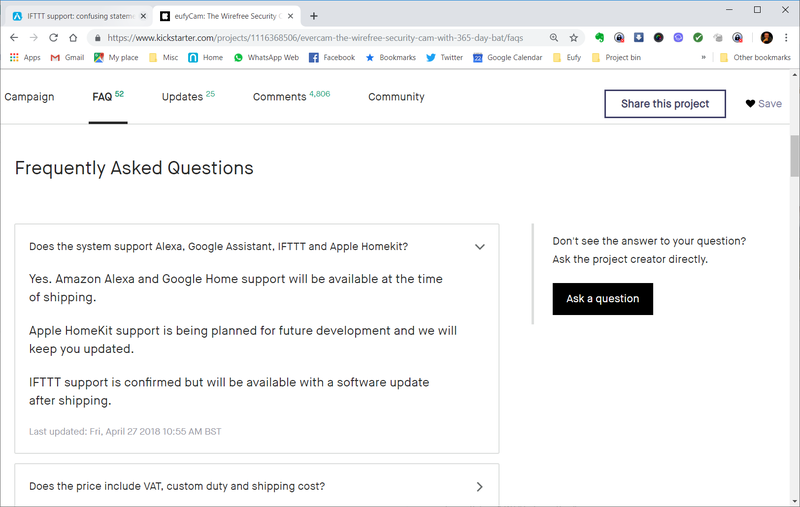 As Anker responded to one of your post (see quote) they are still considering IFTTT, I am eager to know the date of implementation. You can contact support@eufylife.com directly for any questions. We are still considering IFTTT for the system. This statement does not mean that we are ruling it out by any means, but we are still evaluating it for the system. +1 to IFTTT support. Being able to sync modes between my other smart home services is essential. I don't want to use geofencing when I already have mode control based on other presence sensors. 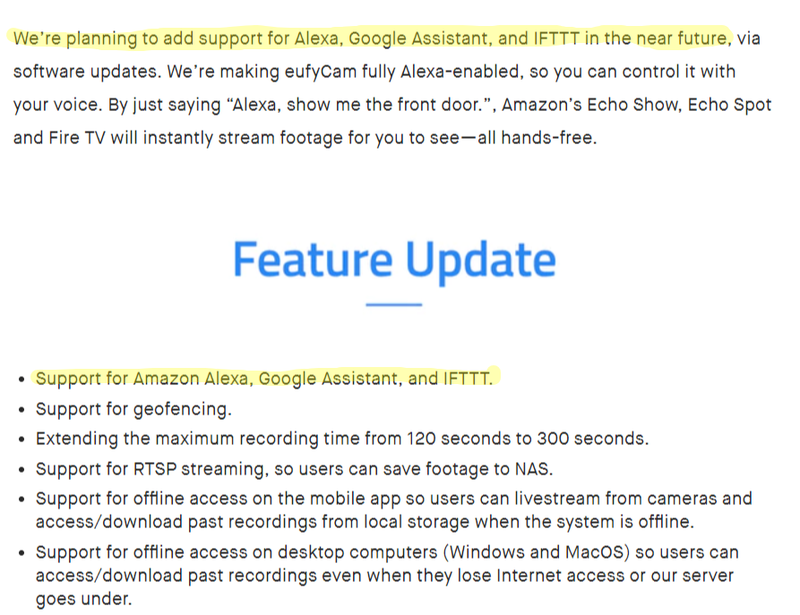 Totally agree, I really need IFTTT support so I can control and keep the cameras integrated into my home system. I don't want to use geofencing. Also Google assistant integration is not that useful. I think IFTTT should take high priority over those 2 features.. just my 2 cents. I have ordered 5 eufycams and a base station yesterday assuming that IFTTT will be available for this system in the near future. Now I am reading it is not on the roadmap anymore, thus not definitely promised. @AnkerSupport: can you confirm IFTTT will be implemented and is still on the roadmap? Otherwise I will have to get the System returned back to you since this is essential for me and I based my buying decision on this. @AnkerSupport Can you please share the latest updates about IFTTT? Will we ever get it?